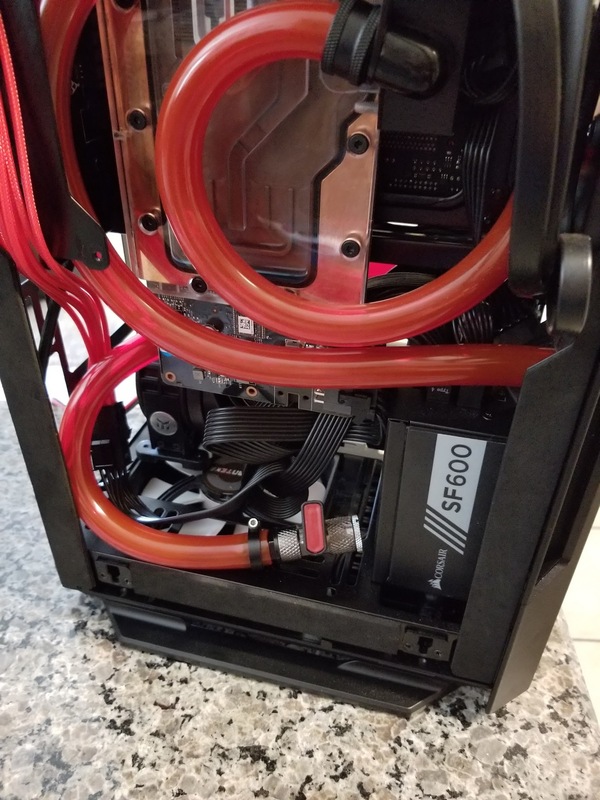 Discussion in 'Water Cooling' started by guitarslingerchris, Mar 5, 2018. So I think I'm going to embark on building an ITX rig for my living room for playing VR and just general awesomeness. I plan on using some type of interesting ITX case that will most certainly not have room for the cooling I want so I'm planning on using an external radiator. I was thinking maybe an XSPC AX480 since those look nice and very sturdy and then instead of using the nicer XSPC Desk Stand I would use their Universal Radstand instead so I could mount it to a wider base that will deal with carpet better. 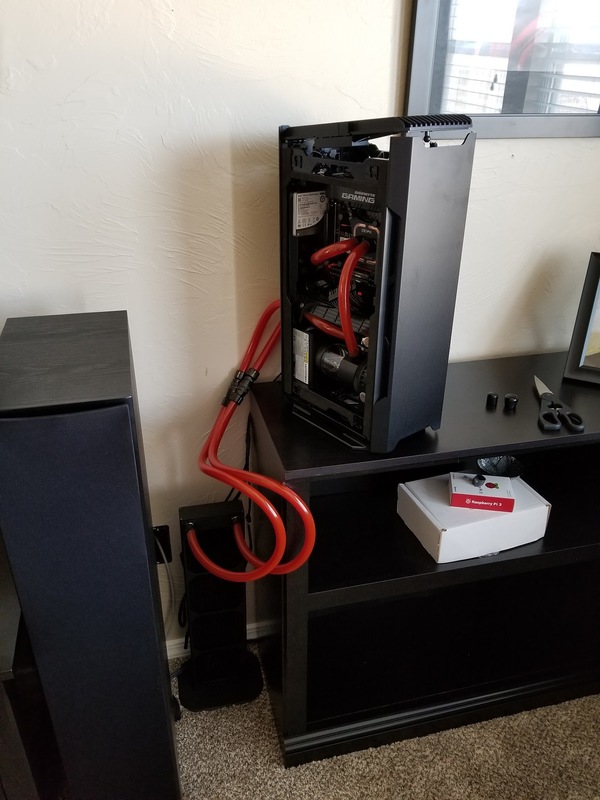 The ITX case itself will sit on my entertainment center displaying all of its' glory while the radiator tower will sit off to the side on the floor obviously with tubing going between and I have some Koolance QC fittings I can add as well to make dealing with things easier. What I want to know is what am I missing? Is there some odd caveat or aspect of this I am missing or that I will have issue with or is it smooth sailing? nothing special about that, lots have don't it. just plum the case to a couple QDCs at the back to run to the rad. normal custom loop rules apply. May want a second pump, depending on how much rad, extra tubing, and how restrictive your rads and blocks are. Haven't done it myself, so that's about all I can offer. Call me crazy but doesn't an external rad defeat the purpose of going ITX? 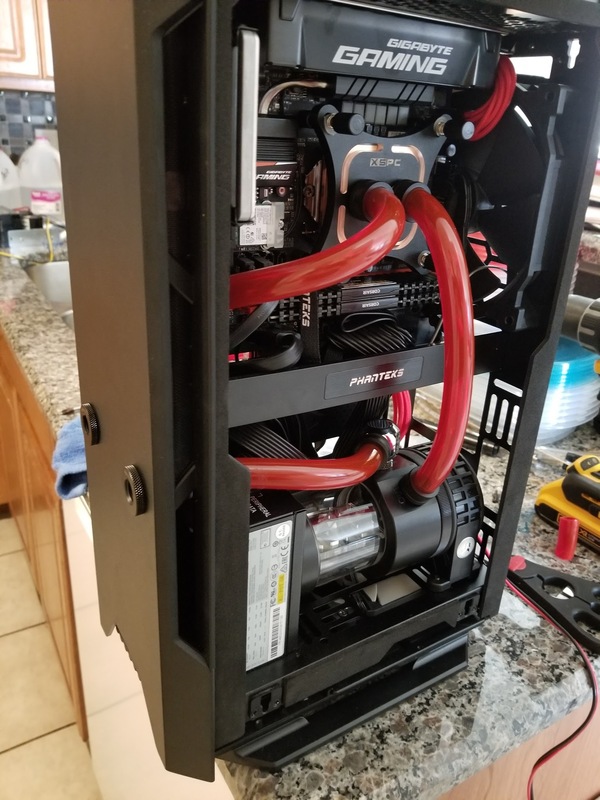 At that point I would rather go MATX and put a rad inside. Still relatively small and easier to move than two seperate pieces. That is good to hear. I'm hoping to plumb a passthrough fitting but we'll see how that works out. 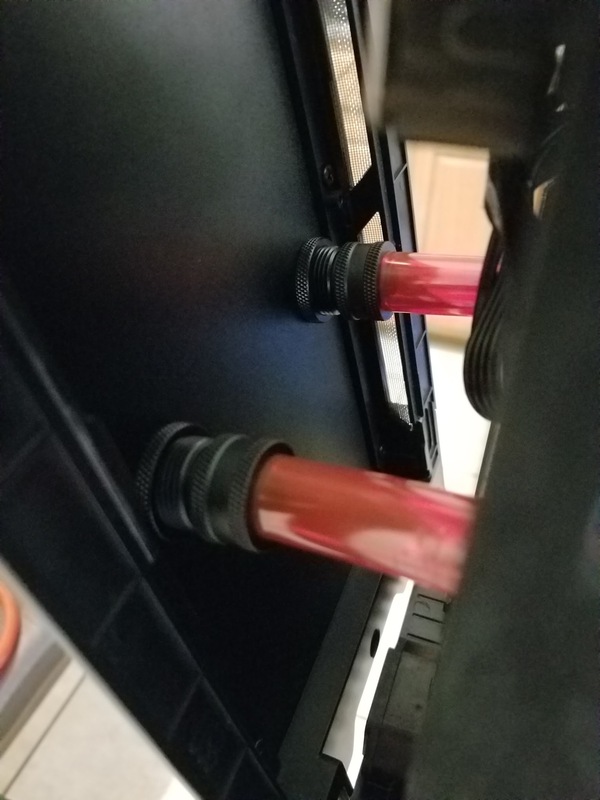 I'll be using an extra D5 pump I've got laying around and it will just be a single 480 rad along with my XSPC Raystorm Pro and my 980 Ti with an EK block. 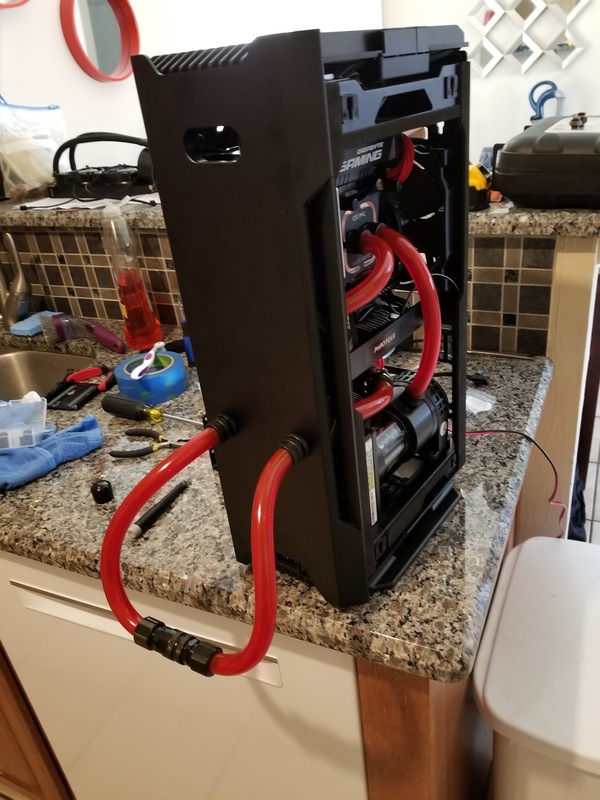 I would have to measure but I can't imagine this would be more restrictive to the pump than my V3000 build is with a single D5 running through my monoblock, dual 980 Ti blocks along with two 360 rads and a 480. Nah, you're thinking way too small. It does and it doesn't. I wanted a project that was fun and I wanted a show piece of sorts that will fit in with the girlfriends' living room look but won't skimp on performance. I could just put together an ITX box with normal cooling and stick it in the entertainment center and not get to enjoy building it or looking at it but if I try to do a fully contained custom loop I will definitely be making concessions on performance with a 980 ti or 1080ti in the loop as well as my 5ghz 7700K. At the same time I got approval to show off a case on top of the entertainment center but I don't want it to be large and obnoxious. This lets me put the PC out with the other crap adoring the living room and remotely hide the radiator without sacrificing performance. What case/s are you considering? Are you running fans on the rad? My first concern there is carpet and sitting on the floor in general. At a minimum, it raises cleanings or temps if slacking on cleaning. Could you mount the rad to the entertainment stand so it's not on the floor? The restrictions are already covered but don't forget to factor the head height. D5 looks like it's variable and sounds like running 2 pumps so may not be an issue but may cause extra noise if needed higher rpm. Depending on the case and noise and temp tolerance. It may be worth looking into dual slim rads internally to keep noise down. I run 4770k at 4.2Ghz with gtx 980 in a Node 304 with a Coolgate 280 (332 x 142 x 60 mm) and mcp355. Only 2 fans- 1 on rad and psu. I do have a pair of 240 rads that will be free soon including a nice RX240 but the case(s) I'm wanting to use won't fit it and even if they did what is the noise level going to be like with a single 240 trying to cool a 1080ti (which I am not sure will get used in this build but minimum 980 Ti) plus a 5ghz 7700K. I have no hard data to back up the assumption but I think it's pretty safe to assume regardless. I went ahead and ordered a Phanteks Shift, the Shift X will definitely be too tall. I was strongly considering the Lian Li PC-05 and may still go that route as it will match my V3000 but it's also triple the price for no real gain. I ordered the AX480 rad with 4 fan combo since it was 4 cents MORE expensive to buy the radiator alone. I plan to run the fans at low speed so they're nearly inaudible and if those don't cut it I will break out the gentle typhoons. As far as the carpet goes I had the same concerns and still do. It is totally possible to mount the radiator to the back side of the entertainment center and that may happen as I could just 3D print some ABS hooks to hold the radiator in place securely but also make it easy to remove for maintenance but that also means I would need to space it out from the wall a bit to allow for airflow. I would love for some more case suggestions as I think I've worn out Newegg and other places browsing ITX cases that are also showpieces AND shorter than 19" tall. If I went with a horizontal case the Lian Li PC-05 is high on my list as is the Nanoxia Project S Mini but I would love to see more suggestions. I agree with a single 240 not being quite enough cooling without high/er rpm. My 280 with a SINGLE Aerocool Shark (may be part of problem) cools nicely at idle, light use. Currently at 29-34c. Playing RL which I know is not even close to VR pushes to upper 50 - mid 60's but no extra rpm since I don't use pwm. Well within spec and still reasonably quiet. 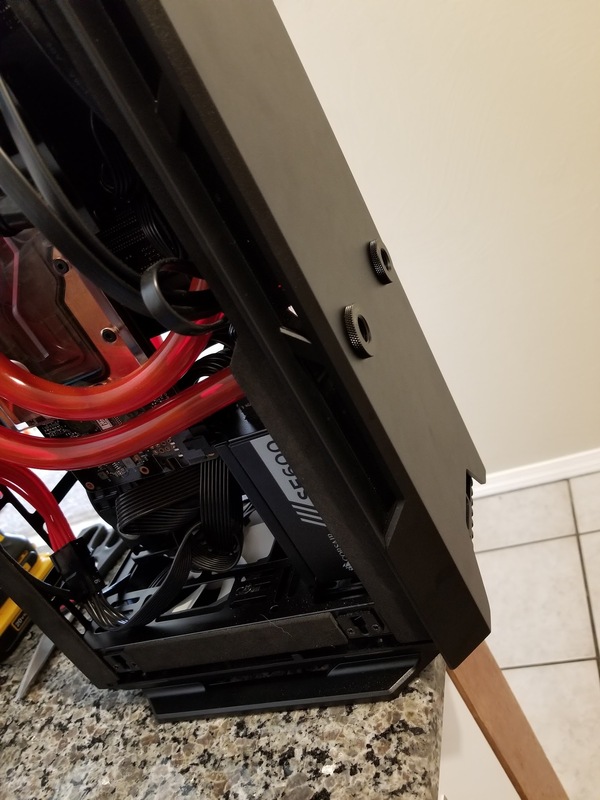 That Phanteks Shift is a beautiful case! vs the Lian Li PC-05 I would say the Phanteks for cost alone. If you have the V3000 somewhere in view of this one, I could see that but that cost! lol. Since you are set with the AX480, it really will come down to preference of the case and tolerance for plumbing. Do you have a link/pic of the entertainment stand? I was thinking if you could mount/hang it to the underside of the shelf or top. Would save some space behind the stand and someone hide the rad. With the quick-connects recommended, it may make maintenance easier? As for case options. Some of the pics I seen with that Shift case horizontally look really nice. Gives a nice top window for viewing. Looking at the Nanoxia Project S Mini was difficult to find FS. Nice looking case though. 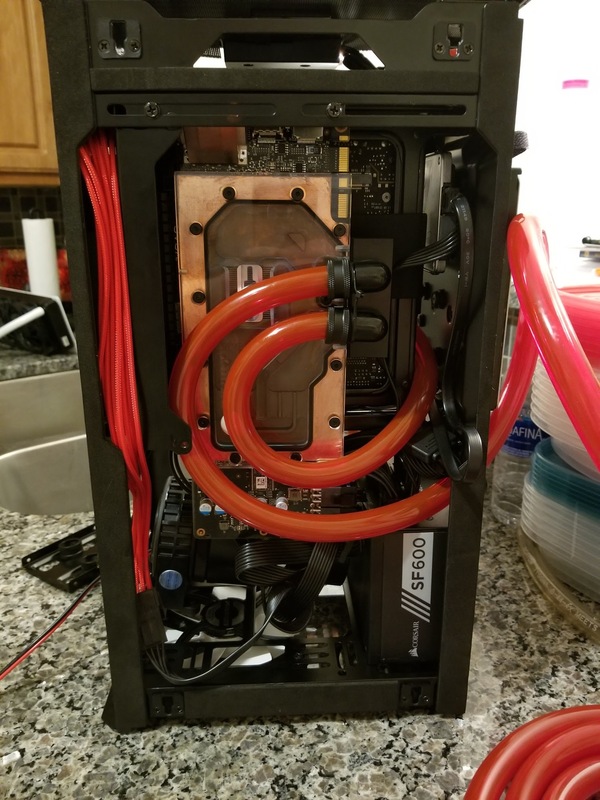 With going through this much work, is adding a window to a case out of the question? Definitely modern but thought worth mentioning as a barbone kit (case, PSU and mobo) makes it somewhat intriguing. Price is between Shift and Lian Li but would need a window added making it less appealing. 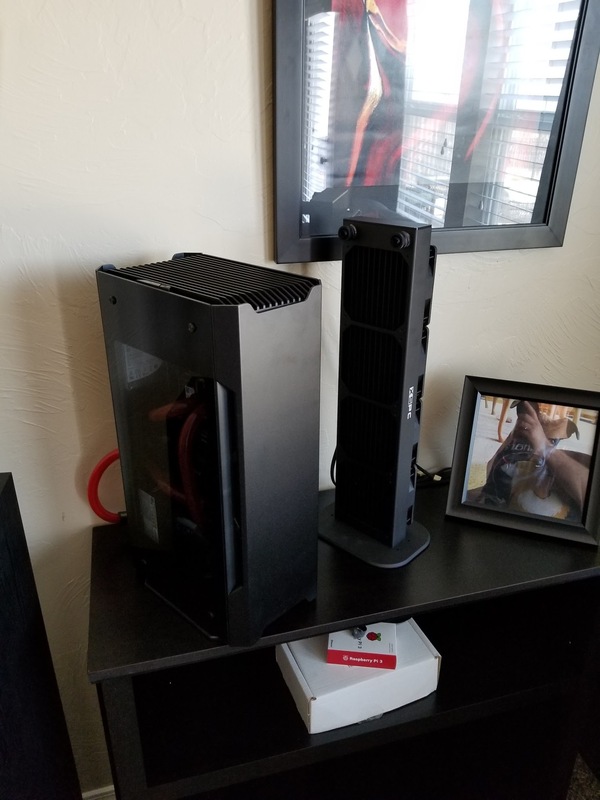 Windows ITX cases worth mention IMO. Simple design, sleek look and within your dimension requirements. Same simple, sleek look, larger window for drooling. Even has 3 color options. Hope this helps, Make sure to post in build log, definitely interested. The entertainment center is of the smaller variety just chillin' underneath where I hung the TV in the living room. There would be room on the back side to hang the radiator but I would still need to pull it out from the wall. If the radiator isn't going behind the entertainment center mounted or otherwise then it will have to sit on the floor next to it basically. I think it looks nice horizontally but really it just kills the idea that I have in my head of how this will all look. It is definitely not out of the question but I would need to be able to add a smoked tempered glass window to it and have it look spot on. 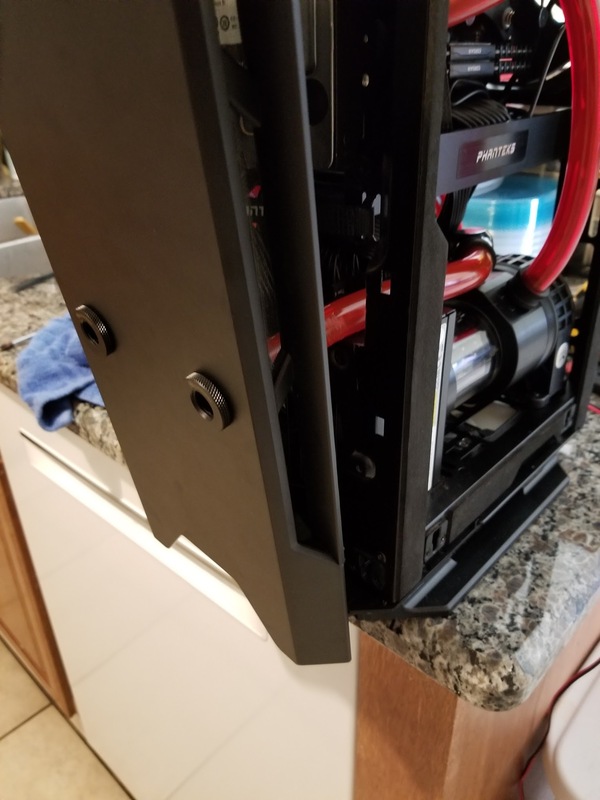 Normally I would be looking for excuses to modify the case but I want this to look spotless and clean and since I'm in the middle of a move and still want this done relatively soon that means it is unlikely to happen right now. It is certainly not out of the question either that if I find a case better suited to this later on I will switch if I don't find it before I use the Shift. As far as the other cases you linked they cover all the bases except for being a real show piece. Something that doesn't scream computer but more a fixture in the living room. Something you don't have to nerd out over to appreciate. I want people to come over to hang out and have it be a conversation piece and be stylish enough on its' own to deserve a place in the room even if it wasn't being used as a PC. A little on the pricey side, but what about Lian Li PC-Q37WX? Otherwise I think you can't go wrong with that Phanteks Shift you already bought lol. And too bad In Win didn't produce the 806. Was thinking if there was a different case you liked but it didn't fit the room. What about vinyl wrap? You can get pretty much anything nowadays. Just a thought. Well I've done it... sorta. I built what I wanted to build. I'm leaktesting now with SysPrep and I'm short a few fittings I discovered I wanted that will have to get installed when they arrive but aside from cable management for aesthetics I'm done. Performance seems to be what I expected with a D5 having no problems going through everything including the quick disconnects on either side of the 480 rad. Hakaba, Chapeau, pendragon1 and 1 other person like this. I reclaimed that block from eBay where it had been abused and left with junk in it for months so it isn't the cleanest/prettiest block around but it does a good job on my one remaining 980 Ti so I'm not too worried about blocking it plus I like seeing the tubing because it makes me happy. As far as hardline... 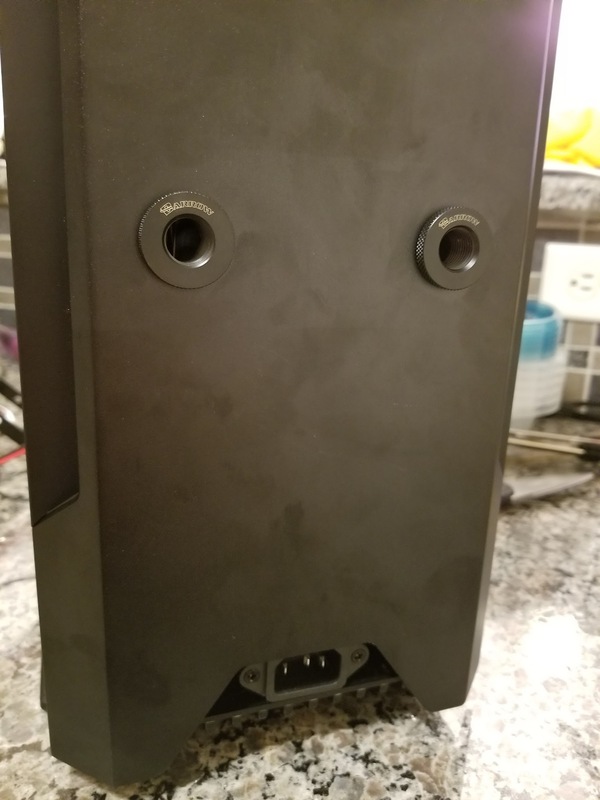 I was already pretty close to pulling the trigger when I started with the idea for this case but I decided against it for now. I think it would be very silly to assume I won't remake a lot of this over time so I think hardline is a good possibility in the future.